If Cardinal Alfons Maria Stickler were 30 years younger, he would've been a star of the current pontificate. Shown at right, Stickler had two key Ratzi-friendly attributes going for him: he was a Salesian of Don Bosco and an apostle of the Tridentine Missal. Not to mention that, as an Austrian, he shared a linguistic and cultural background with B16... so that makes three. Alas, long retired as the librarian and archivist of the church, it wasn't to be. The Austrian prelate -- the senior cardinal by age -- died yesterday at 97. 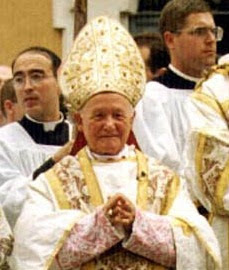 Named to head the Vatican Library in 1983 and given the red hat in 1985, after retiring three years later, the trained canonist spent much of his post-administrative life advocating the return of the "Old" Missal; he offered a high-profile '62 Mass in New York's St Patrick's Cathedral in 1996. In a 1997 essay on the post-Conciliar liturgical reform, Stickler argued that "the Latin language acts as a reverent curtain against profanation" in the Mass, without which loomed "the danger that through the vulgar [vernacular] language the whole action of the liturgy might be profaned, which in fact often happens today." The cardinal's funeral begins at 5pm Rome time (11am EST) today at the Altar of the Chair in the Vatican basilica. Given their similarity of mind on things liturgical, the Pope might just have a special "tribute" or two up his sleeve. On a related note, word's tripped the wire that black vestments are on heavy back-order from the Roman ateliers. Though pastoral custom in recent decades has overwhelmingly favored the use of white vestments for funeral liturgies, the use of black -- or, for that matter, violet -- in Masses for the Dead has never been prohibited.